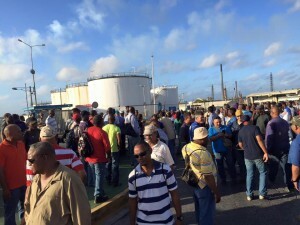 WILLEMSTAD – The government mediator Randolph Gijsbertha indicated that that today there will be a meeting between the union representing the contract workers of the oil refinery SGTK together with the contractors to see if both parties agree to the proposed agreement. According to Gijsbertha the proposed agreement, which will be presented today, is a reasonable one. But it is up to parties to accept them. Gijsbertha explained that of course, he cannot give details about the proposed agreement and that during the meeting they will give more information about this to the parties. This of course to avoid any misinterpretation. Union leader Alcides Cova assured that the actions will continue today. “The government has asked us to give them 48 hours to find a solution and that we did. We have to hear now what they have accomplished,” said the union leader. Yesterday, during the third day of strikes, the contract workers were in downtown Punda to talk to several Members of Parliament. Cova explained that parliament is the most important institution in our country and this is one of the reasons why the employees wanted to talk to them. They did talk to a few of the MPs who showed empathy for their actions. The MPs did promise to help in any way they can.